Any device used to secure running rails into chairs or baseplates or directly to sleepers, bearers or other rail supports. 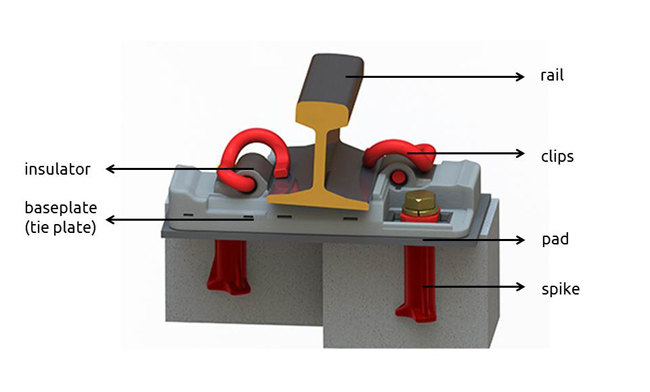 Rail fastenings keeps rails fastened to sleepers (transfer of forces), provides a proper slope of rail foot (1:20, 1:40) in the transverse plane, prevents the rail from longitudinal movement, damps noise and vibration coming from rails. hold rails securely in the rail seat. limit the rotation of the rail about the outer edges of the rail foot. minimise longitudinal movement of rails through creep and thermal forces. assist in retention of track gauge. not cause damage to the rail. Where practicable, rail fastenings shall either be self-tensioning or permit tightening of the fastening to a predetermined load. Where existing rail fastenings are not effective in minimising longitudinal movement of rails, it is permissible to fit rail anchors as a method of meeting this requirement. Clips are used to fasten the rails to the underlying baseplate. Rail screw is a large (~6 in or 152 mm length, slightly under 1 in or 25 mm) metal screw used to fix a tie plate or fasten rail. A tie plate is also called a baseplate or sole plate. Rail tie plate is used in rail construction to support the rails. Tie plates are generally used to take the load of rail and distribute the load to the sleepers offering proven economies. Rail insulator is used to adjust rail gauge and insulate the rail from ties and clips. The rail pad, originally called sole plate, is used when rail is attached to concrete, rather than timber, ties or sleepers. Rail pads function to reduce fatigue cracking of the concrete ties, believed to be driven by impact and vibration from the passing train. The raid pad prevents rail-sleeper abrasion and the crushing of the sleeper under the rail foot. Rubber rail pads are normally designed to a specified load-deflection characteristic. The initial stiffness of the rail pad is designed to be low so that that their deformations under the springs toe loads is quite substantial. This ensures that the rail pad remains in intimate contact with the rail despite any vertical movements of the latter. When the wheel is over the pad, the latter’s stiffness must be high to prevent large movements which can result in the metal spring becoming loose. Such a load-deflection characteristic can be obtained by introducing grooves in the rubber rail pads. Rubber pad or grooved rubber rail pad are made up of rubber or plastic to dampen the shocks of vibrations of a passing train. Components that are to be used together (including rail supports, rail fastenings, pads and rail foot insulators) shall be compatible. the form of track construction. European standards are being developed for components (for example, EN13481 Railway Applications – Track – Performance requirements for fastening systems).